The spectacular scenic Verdon Canyon is one of the most breathtaking sights you will discover in the Gorges Du Verdon of the Provence, France in Europe. You can see for miles across the horizon on a beautiful sunny day where the Verdon Canyon in Parc naturel Regional du Verdon in the Alpes du Haute region of the Provence, France, Europe blankets the scenic landscape. The Gorges du Verdon is the second largest canyon in the world where you you will find unbelievable scenery and explore the amazing creations of Mother Nature. The Verdon Canyon in Provence, France in Europe stretches across the land for approximately 20 kilometers and is 300 meters deep in some areas of the canyon. The Verdon River flows through these massive rock cliffs until it finally ends and flows into Lac de Ste Croix Lake in France, Europe. 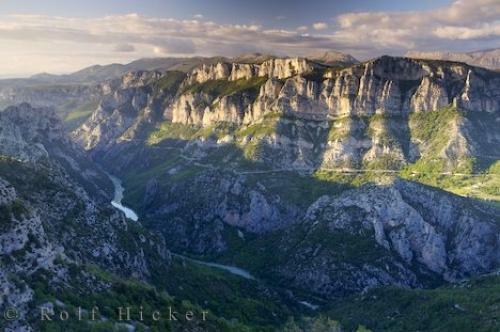 Photo of the Verdon Canyon where the Verdon River flows deep in the valley in Provence, France in Europe. I photographed this photo with the digital SLR camera model Canon EOS-1Ds Mark II, aperture of f/16.0, exposure time of 4/5 sec. on ISO 100, as always I used a original Canon Lens, the focus lenght for this picture was 32mm.